Is it too early to have 'The Chat' yet? Morning Custard Lovers! Can you believe it's Wednesday already? Where's the week going? If you'd like to win your choice of any paper pad and a surprise goody bag from My Mum's Craft Shop, you'll need to play along. But before you do that, head over to MMCS and see the gorgeous creations from the rest of the DT. Tools: Butterfly Punch, Martha Stewart, Swiss Dots Embossing Folder, Nesties, Paper Duffer Uppper! I'm loving this gorgeous card, i've never attempted a circle easel, but think I just might give it a go after seeing this beauty. Your bow is perfect and you're right to give it it's own photo. Gorgeous card - lovely bow too. You can't leave us dangling like that though - so what did you say to sweet cheeks!!!? oh kids they are so adorable ! and what a gorgeous card ,love the embossed background. Far too early for that talk yet....anyway send him dad's way when he asks again!! Gorgeous card Faye, i like the design and your lovely bow, your post has put a smile on my face, sweet cheeks wants a baby, time to invest in a kitten lol. Cute card and very amusing story ! Love the circle easel card! The distressed layers are a great touch! The bow is perfect too! OMG... how funny..should we start calling you Nan??? lol.. oh go sit down and have some chocolate!! Another gorgeous creation hun...and I love the embossed background and your pretty bow sweetie..
lol...have you had that chat yet! gorgeous card Faye...love that shade of pink. Did you answer sweet cheeks then?? Thank you for the birthday wishes too!! 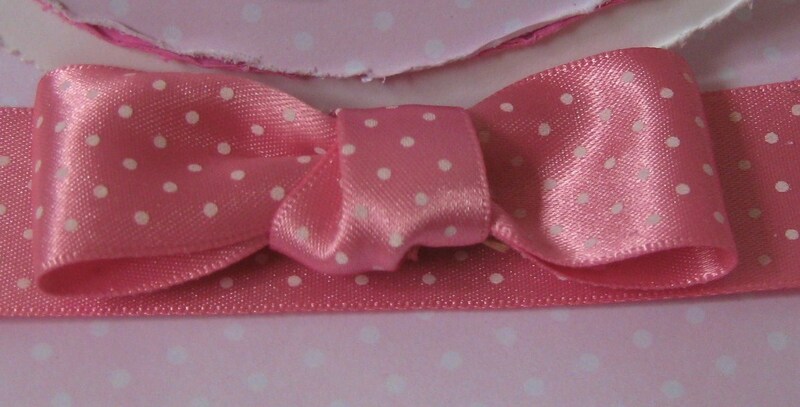 Your little easel card is adorable and I do LOVE that bow!!! So pretty. You do know that it really won't be that much longer before you have to have that "little chat" for real!! They grow up so fast. Well, I can't believe Wednesday is over!!! Where did it go:-(...? PS: So, have you had the chat? I have never made an easel card so I was already impressed! Love the papers, bow and the little butterfly in the corner. I think it is darn cute! What a pretty easel, Fluff! How is Sweet Cheeks by the way? Fully recovered? I hope so! Pretty in pink Faye:) I love the distressed circles and pretty bow! 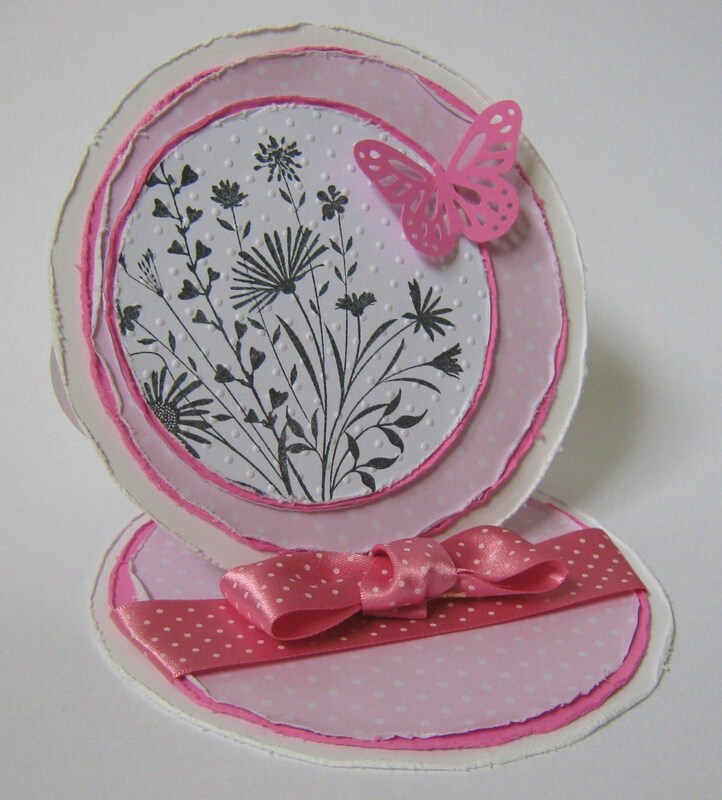 Beautiful card love the embossed image and the butterfly. Laughing at 'I want a baby, Mummy!' I would not know where to start explaining that one to a little boy!! A very nice bow indeed! The card is pretty hot too, love the circle easel you brave girl! I won't be entering this challenge!